THE RICK HANSEN TEAM: KEITH BAILEY, ACCESS MANAGER ANDRE GORDON, DOUG COPLEY, HEATHER NELSON, JOSH YATES. 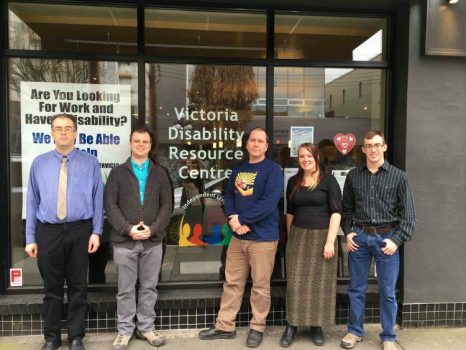 For the past 3 months, operating from the VDRC offices on Fort Street, The Rick Hansen Foundation JCP Victoria Team have been scheduling and conducting accessibility assessments throughout the Capital Region. So far we have conducted a total of 18 assessments, of a range of properties from small government offices to an historic cathedral. And we have reviewed every branch of the Greater Victoria Public Library. Throughout our assessments, we have seen some great innovations and serious considerations for accessibility. In general, we’ve noticed that many public buildings implement good acoustics, which helps people with hearing impairments. Internal ramps are also, in general, well-designed throughout the city, helping people with mobility impairments. We are working with property owners to improve or create accessible entrances by utilizing space for ramps or refurbishing currently unused elevator systems. We hope the work we do during this project and afterwards will help improve these and other aspects of building design and planning. The biggest trend we have noticed with all our assessments is that the clients, building managers and city staff we have dealt with are extremely positive and accommodating to our cause. Many clients, especially city staff administration, have expressed an eagerness to learn more about accessibility because it is becoming a serious priority in the planning and property development departments of many large organizations in Victoria. People in positions of leadership in Victoria have expressed a clear desire to implement accessibility solutions yet currently feel unsure which direction to move in. The Rick Hansen Foundation JCP Victoria Team are here and happy to help.